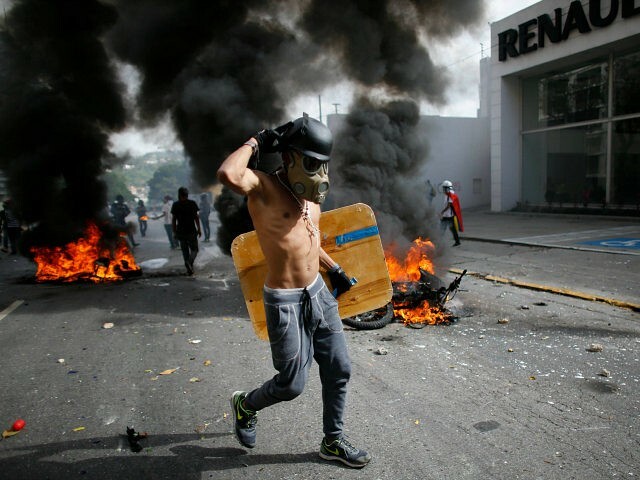 Venezuelan student groups and opposition leaders who assembled before the doors of Venezuela’s state television network VTV Friday afternoon were met with armored tanks, dozens of soldiers, and snipers awaiting them on the network building’s rooftop. Local news outlets began reporting Friday morning that locals near the VTV center in Caracas had seen an influx of Bolivarian National Guard (GNB) soldiers surrounding the building, driving armored tanks near it, and placing soldiers on the rooftops with long-distance firearms. Police and soldiers also blocked entry by vehicle into the entire street. Student groups and opposition parties scheduled a march to walk through the block on which VTV’s headquarters are located in the Venezuelan capital on Friday to demand that the state-run network, which taxpayers keep functional, broadcast fair coverage regarding the protests. “We demand VTV show the reality, that they have ethics and show solidarity with those killed,” Rafaela Requesens, president of the FCU-UCV Federation of University Centers, told reporters at the protest. #OídoALTambor #2Jun 12:55pm @RRequesens: "Exigimos a VTV que muestren la realidad, que tengan ética y se solidaricen con los asesinados"
“We tell Diosdado Cabello and the Zurda Conducta people: retract, you are saying things that aren’t true,” he concluded. Diosdado Cabello is the socialist Minority Leader of the National Assembly, once the president of the national legislature before the opposition took it over. He remains one of the most powerful members of the ruling United Socialist Party of Venezuela (PSUV) and hosts a program on VTV titled Con el Mazo Dando (“Hitting with the Mallet“). The program’s webpage is currently promoting pro-Maduro, government-mandated rallies and the government Twitter hashtag #AquinosehablamaldeChavez (“We don’t speak ill of Chávez here”). Zunda Conducta (“Leftizt Conduct”) is another prominent socialist opinion show on the network. Among other programs VTV broadcasts are its flagship show, Sundays with Maduro, which often features the head of state dancing various musical genres; Cayendo y Corriendo (“Hit the Ground Running”), a show whose host has accused global media of a “war” against Maduro; and La Hojilla (“Cheat Sheet”), once called Hugo Chávez’s favorite television show. “We want to advise journalists and workers who make decisions at state networks that they shouldn’t sink with Maduro,” Freddy Guevara, the acting head of the Popular Will political party, said Friday. The head of the party, Leopoldo López, is serving a 14-year prison sentence for organizing peaceful protests in 2014. He asserted that VTV’s image of Venezuela was “a nation of wonders” when, in reality, Maduro’s Venezuela is falling apart. By Friday afternoon, images surfacing on social media seemed to indicate that few were too intimidated not to participate in the VTV protest. Videos instead surfaced of elder protesters shouting down soldiers, demanding they cease attacking peaceful assemblies. The man in the video below shouted, “Nicolás Maduro does not own anything here” and demanded the soldiers leave. Una ciudadana aprovecha para hablar con los miembros de #FANB cerca #VTV #Caracas #Venezuela pic.twitter.com/E8P2HpaSD5"